As all faithful members of Fill The Steins Nation know by now, Fill The Steins was proud to once again sponsor Erin’s Run, a 5K race and walk along the picturesque Bangor Waterfront that was founded last year to raise money for Spruce Run and to support a scholarship for the University of Maine Swimming & Diving Team. 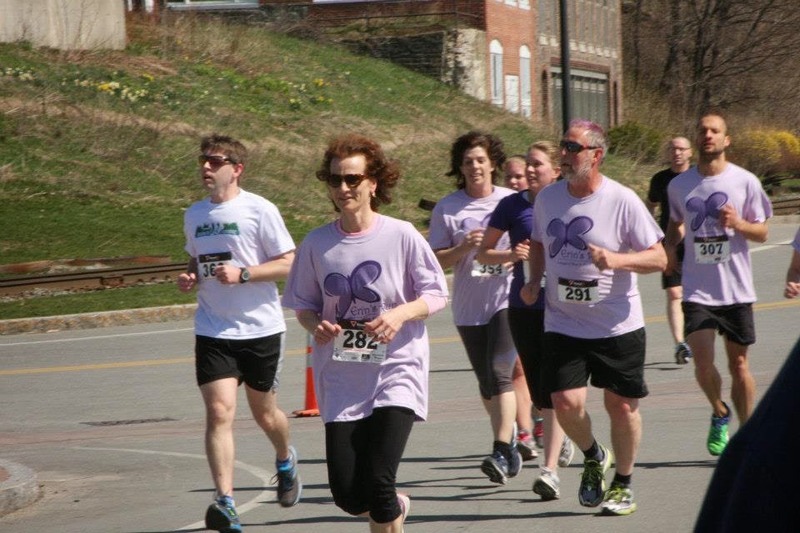 The race is run in memory of Erin Woolley, a Bangor native and University of Maine graduate who passed away in 2010 after a courageous battle with cancer. Erin’s life, although all too short, was extraordinarily meaningful to those that knew her and to those that were impacted by her tireless work advocating for women and the less fortunate. Erin was an inspiration in every sense of the word and her ongoing legacy is what inspired Erin’s Run. For the second year in a row, I am proud that Fill The Steins was able to be a sponsor and even more proud to personally be able to attend last Saturday’s race. Although my ongoing recovery from bilateral hip replacement surgery prevented me from actually running in the event, I was happily able to walk (pain free!) with my wife, mother, and 16-month-old daughter. Much like last year’s inaugural event, the mood at Erin’s Run was a unique mix of celebration, positivity, and sadness. The race and overall day are unquestionably meant to celebrate a life well-lived and the pre-race speakers (including Bangor Mayor Ben Sprague and UMaine women’s swimming coach Susan Lizzotte) did an outstanding job of setting that festive tone. Without question, I got caught up in the positivity of the day. Being from Bangor originally, the race was not only an opportunity to celebrate Erin’s legacy and the causes for which she fought, but also to catch up with old friends, many of whom I hadn’t seen since last year’s race. To be able to reminisce with fellow UMaine and/or Bangor High School alums, all of whom have a connection to Erin, was a very special feeling that I’ll always remember. I have to say, through no fault of anyone, I was unexpectedly struck with some sadness as the event wrapped up. My wife and I were circulating, saying our goodbyes, when I had the chance to speak with Erin’s dad, Russ. I didn’t get a chance to talk to Russ at last year’s race and hadn’t seen him before this year’s event, so I was thrilled to get to speak with him before we headed home on Saturday. As I alluded to, our conversation, however, left me sad. Not because of anything that was said…in fact, we never directly addressed Erin at all in our brief chat. No, it was the fact that I, the father to that aforementioned 16-month-old little girl, was looking at this man who was forced to say the ultimate goodbye to his little girl. Of course, Erin was not a little girl when she passed away, she was an accomplished, successful, and brilliant woman. But my wife and I often say that our daughter will always be “our little girl”, and while I was talking to Erin’s dad, I couldn’t help but think he always felt the same thing. No parent should ever have to bury their own child; for it is one of the true everyday tragedies in our society. Russ, his wife, and the entire Woolley family should take some small bit of comfort, however, in knowing their daughter may not physically be with us anymore, but her accomplishments, her causes, and her legacy, will live forever, both through Erin’s Run and also in the hearts of everyone who ever knew or has been impacted by her. For what it’s worth, I think that’s a pretty happy thought, and it’s already got me excited for next year’s race.